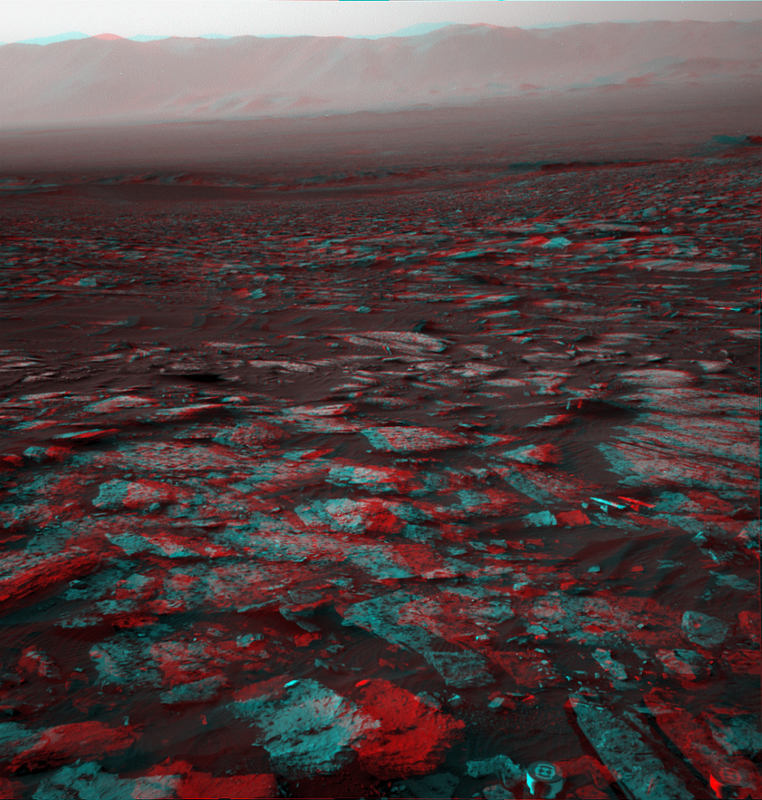 Get your 3D glasses on and go roaming...awesome!! 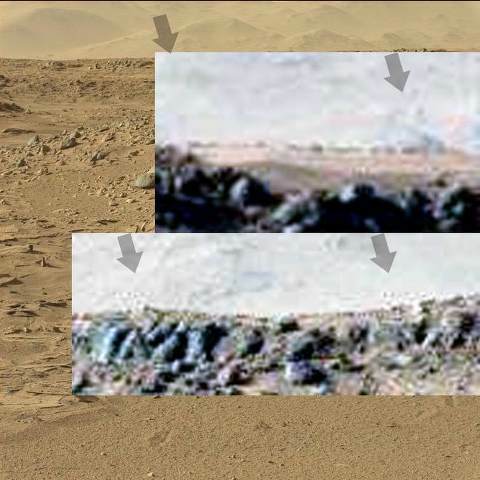 I am becoming more and more convinced that Mars is wet, (the water wearing down the rock, is a slam dunk). 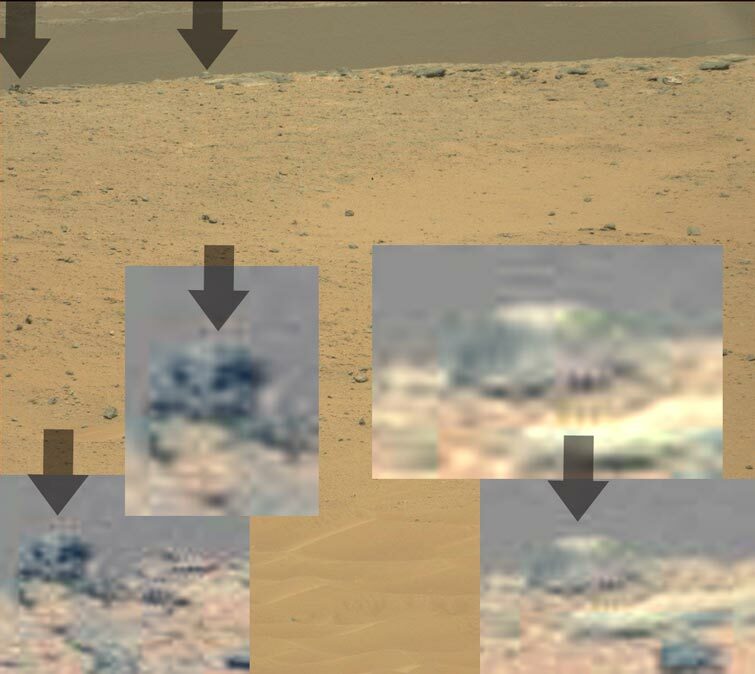 I would love to say that the martians are having a burnoff, in this reflective rock, but it is more likely distant dust devils. 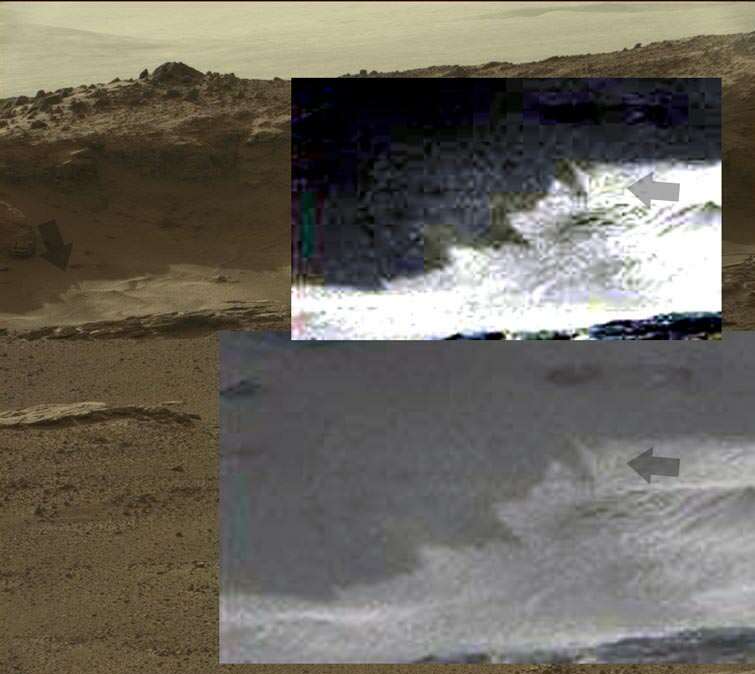 In the images taken by Opportunity in September 2006 from Cape Verde looking down the nearside slope, suggests a large pool of standing liquid with probable run off towards the left hand side. Looking closely at the admittedly low quality .tif image, the data point is unlikely the result of aeolian weather conditions for two reasons. 1. The transparency of the liquid surface and 2. the way the liquid "hugs" the "coastline" so to speak. I have spent hundreds of hours deep in the western US Mojave desert in "all seasons" and know very well how water from various sources collects and "pools" in the sand and as the image shows further down the page, (also from Victoria Crater) one can see how the liquid has drained "through" the sand base. Yes, weird, and it also looks like NASA got to it, and colorized it, so it doesn't look like water, (it looks more like a glassy substance, but with the edges, it has to be liquid). Just revisited some of my older mars images. It is advanced structures like this, that makes an advanced civilization on Mars likely. Well, that and seeing a ute driving up a dirt road on Mars, also helps. And more bridges with cars driving over them. I would say that it is a sure thing that Mars has algae, and weather patterns or rain, and is relatively wet, (even with the underground springs being relatively dry). 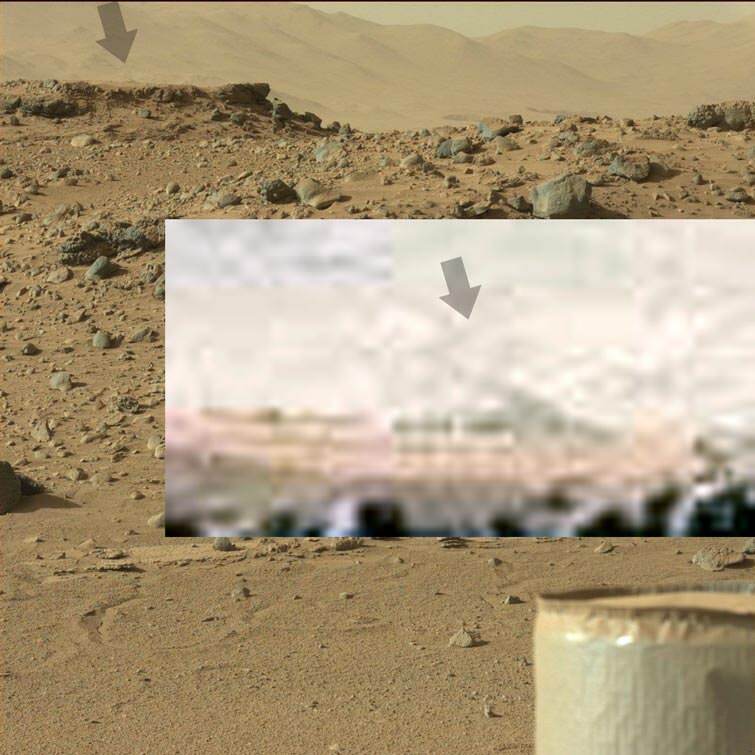 Some of the dirt, or mud clinging onto the rovers wheels, only enforces this view, (you can't have supposed bone dry dirt, clinging onto the wheels like that, but l am sure that NASA will give us a Jack and Jill explanation). May I ask which software program you're using for imaging? Pressing Shift/Control and then B, gives us true color, and l also use the contrast/brightness one a lot, (that is not available on the cloud version, trial of full). From what l last heard NASA will put a drone on their next rover, (2021) so we will get aerial BS, instead of ground level. Hopefully Musk will get there next year, and when they find something interesting they will go and take a closer look. 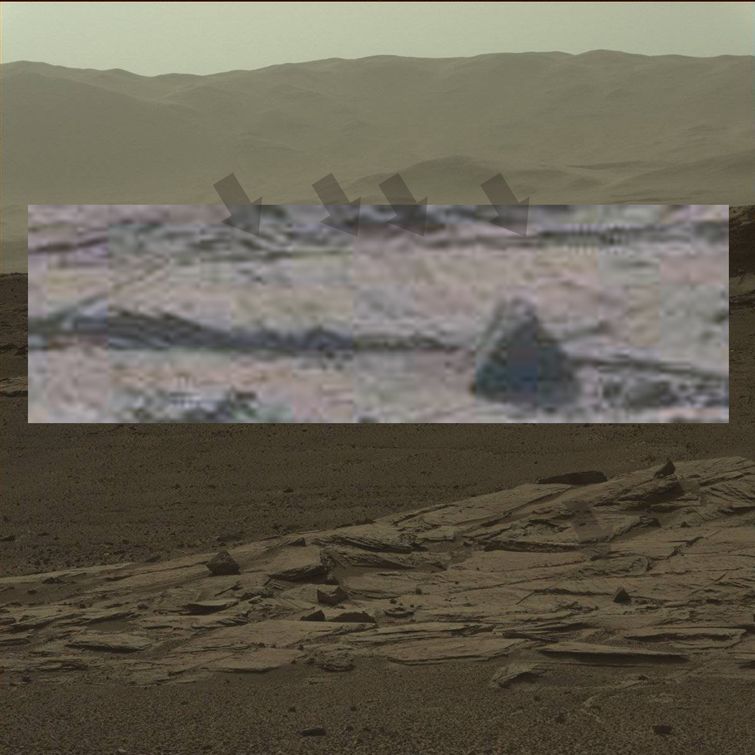 Spotted this in the distance, and it is a white structure of some kind? 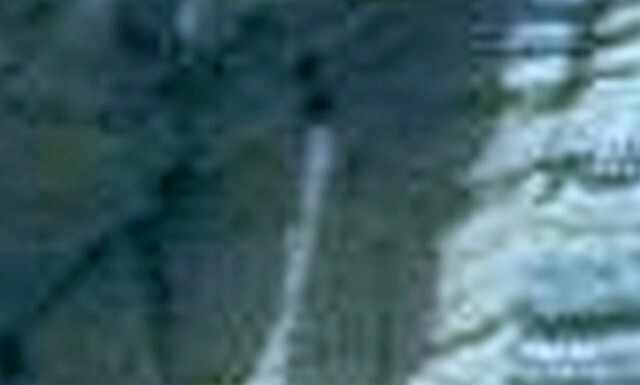 Lower image is showing these weird structures, that look like sculptures? It also shows the previous structure, with white towers going away from it; power generation perhaps? But either way not natural and not ancient, (unlikely they would be standing if they were). Can I get a "page source link" to where these images above are located? What are these numbers, are they a page code? In future, could you please indicate the image location so we others can analyse the data too? 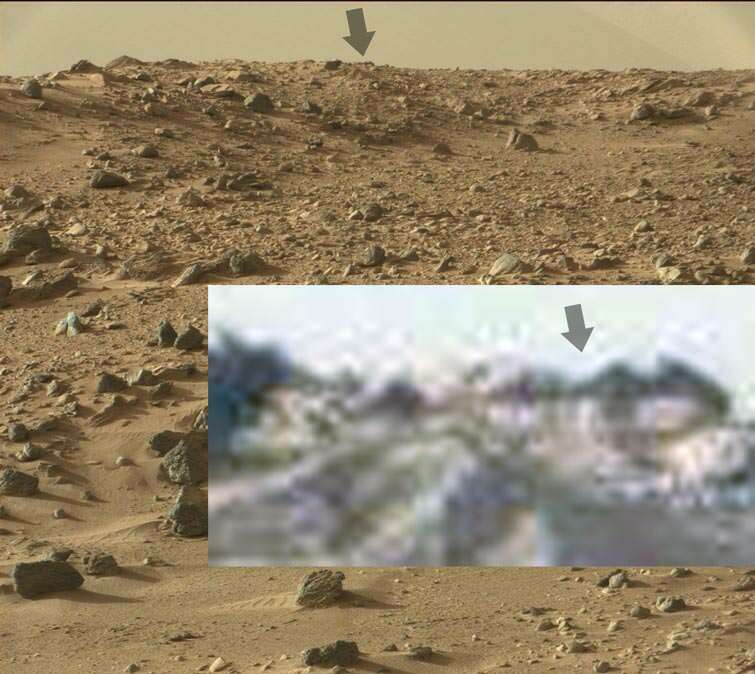 Currently up to Sol 571. 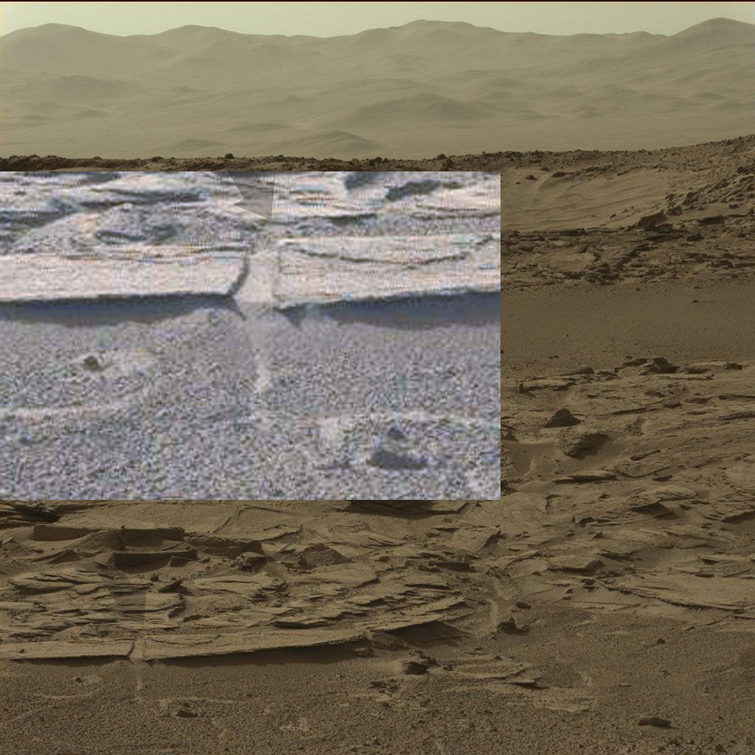 So after reaching Sol 571, (drop down list) then run through the images til the designation matches. I only look at the full images ones, since the movie, letterbox format is the same and usually has less detail. Best to bookmark that if you want to fossic about. I think I'm not making myself clear. Your image below is a color image. The raw images on the JPL multimedia page are grey scale. Great, I can go there and spend much time in trying to "match up" your post image but please, it would be so easy if you could just paste the URL of the color image you are focusing on. Am I not making myself clear? 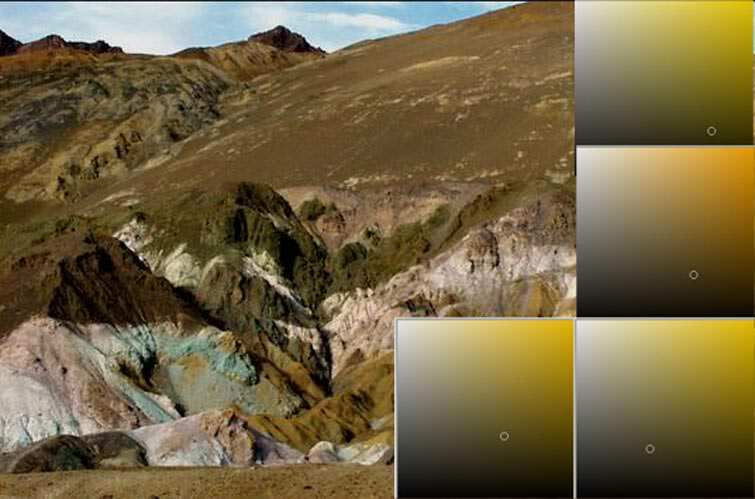 Ok, l get that, and some of the images are grey scale, but l only look at the color ones, (well the orange/gray ones) and pressing shift/control B removes that crap, and shows the true color images. The admin also asked that some time ago, but to be honest l don't have the resources to put the url onto every image, (l download a few hundred and then go through them when l can, so adding a link would slow me down even more, (l am falling behind as is, up to 571 Sols out of 2000+). And l literally use a magnifying glass on every images, and sure l could miss something, but it is unlikely. I would say that the odd hundred viewers that visit here daily want to see something that will knock their socks off, (me included). Ok, thanks for that. Understand, takes a bunch of time checking into images, been there. 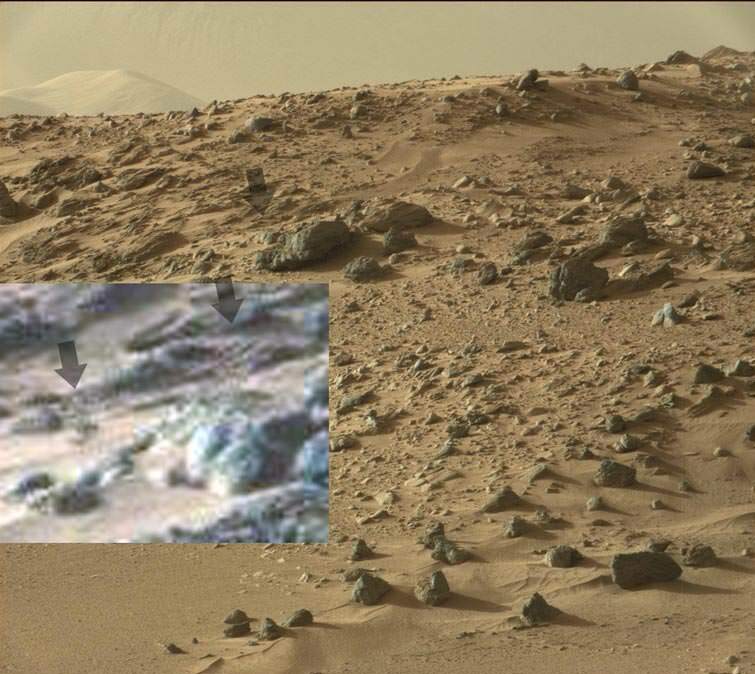 I hope this is ok to post here re: true color of Mars? If not, Admin please move to a better location, thanks. Every now and then, I like to pop the true color on some of the false color images provided by rover cams. 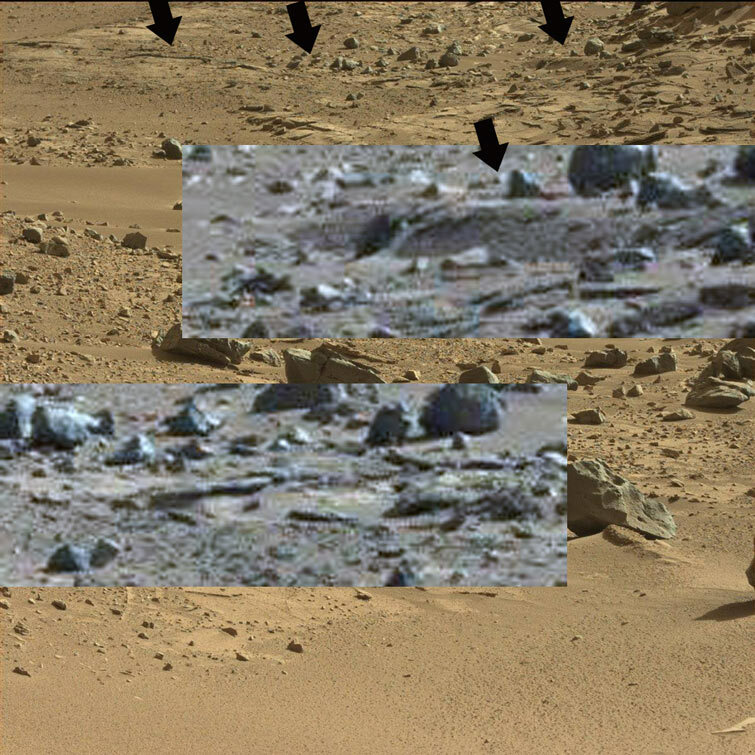 In the above image, take a close look at the very top outcropping. Just below, along the sand bank, there's some unusual rock forms. I love to make comparison images for scaling. 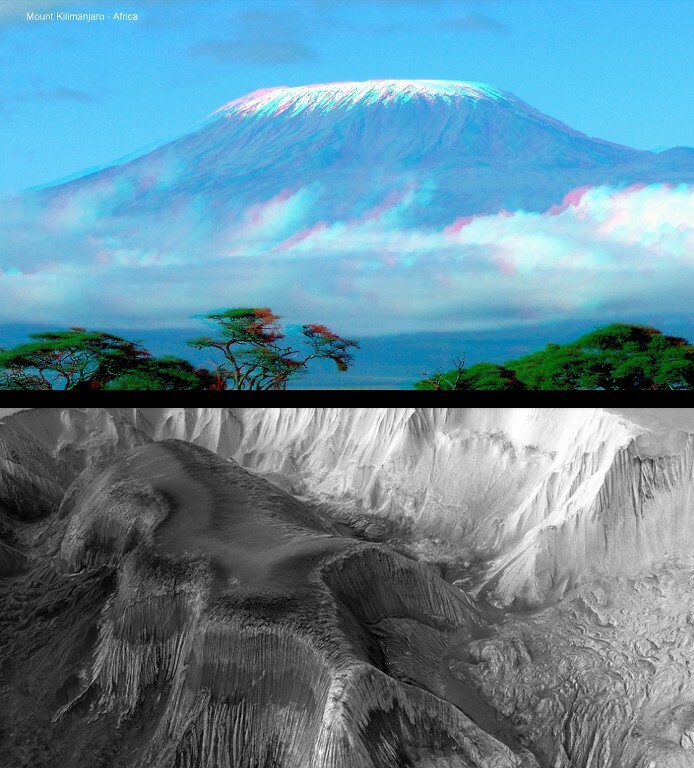 This beautiful 3D image of Africa's majestic Mount Kilimanjaro is roughly 5km from base to summit. In comparison, the "mother" of all mountains though, is "sunken" about 300 meters below the surrounding (closed) canyon rim but the center Mesa is roughly 6km from base to top and is over two time the length of Kilimanjaro and three times as wide! There's much evidence of life in this canyon, the place is chocked full of stunning artwork. The trick is, learning to see it. 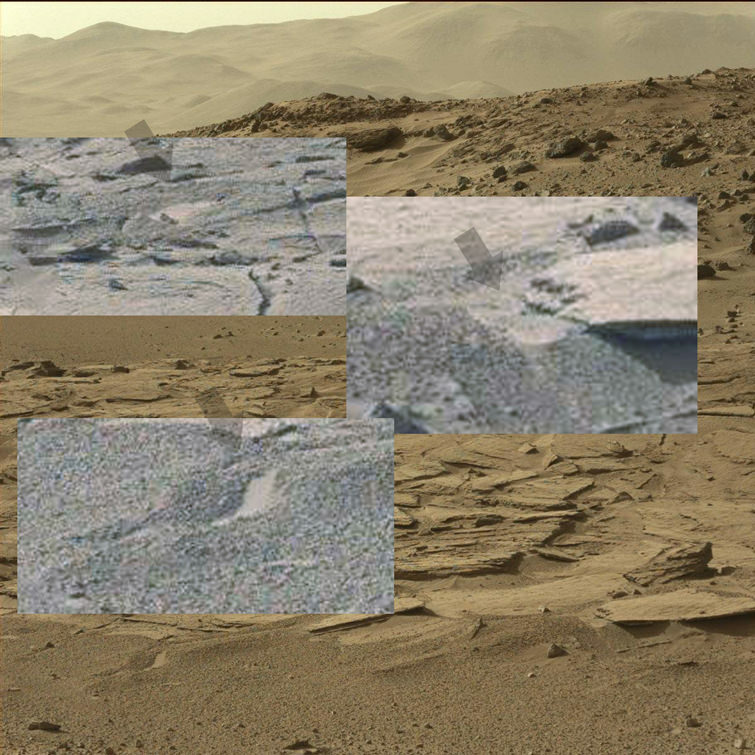 Here's a trick of the light illusion, and an interesting revelation on this controversial "starburst" Curiosity image. The image below has the gamma reduced 50% which accentuates the flow until it divide's at the lower fork. A liquid trace pattern I think. I don't have the file number handy but the image above is quite controversial. The steps are as follows from the OVER RED HUE of the NASA image. 1. Use Irfanview's excellent 1 step "Auto Color Correction Tool"
Interestingly this shows the "starburst or star-man" dissimilar to the surrounding grey/green rock strata. 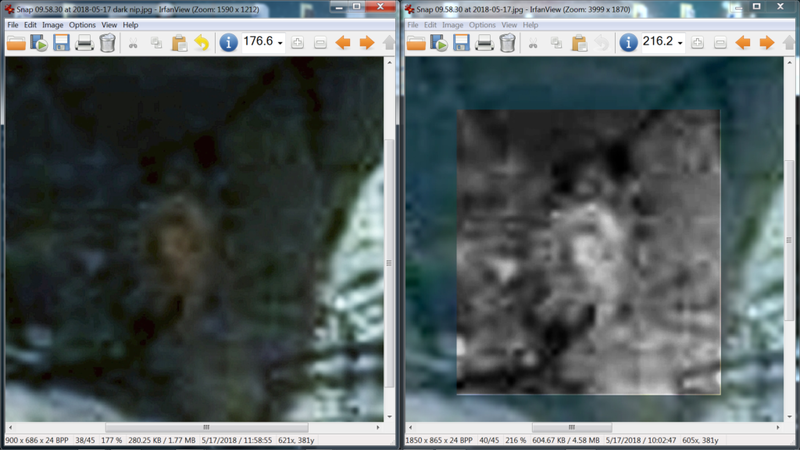 I have not used ANY color enhancement tools at all and the data is showing this "face" in it's true color. The face does not look like a local rock protrusion and is most strange indeed. The sectioned rectangle below has a further 1 step "Auto Color Correction Tool" which automatically increases contrast and hue correction. 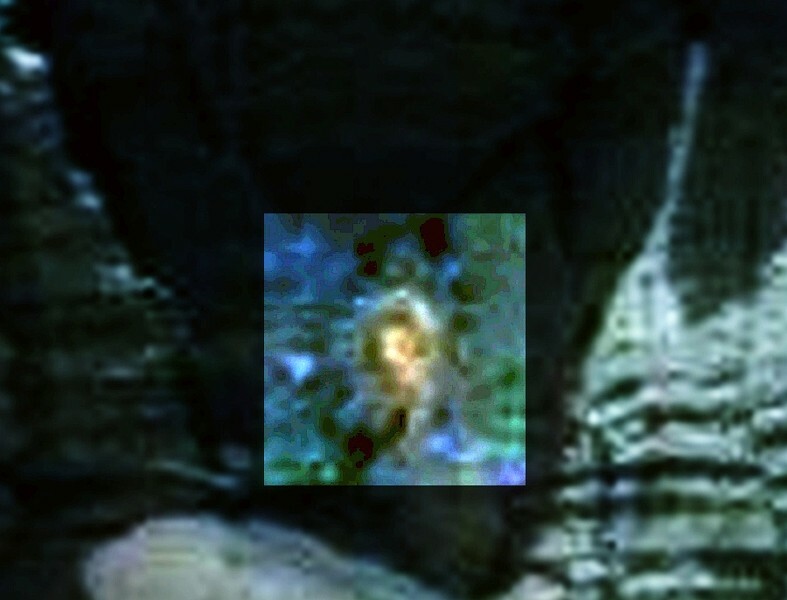 NO other tools are applied to these images an are the natural in-situ colors from the color images from NASA....so I believe. FMP this looks very much like the head/face/neck of a animal-like being caught in the act of poking it's head out at the right time LOL! Nice, Albion3D, Yes, the green on the rocks is blatantly obvious, as are the water flows, which means that the air pressure being 100 times less than ours is BS of the highest order. You can't have algae in an environment where water boils away, or rain for that matter. The face is most likely more art, (l have seen those same color chalks before). Ok, another day another great discovery. I had to go through 18 images, but it was worth it, and yep dark images, (when NASA tries to darken their images there is always something great). I would love to say that these are plants, but it is more likely algae going rampant, or acting like plants. This shadow shows the branches and leaves, (for want of a better word). And computer enhancing it, only shows that this is a shadow and not something in the sand. 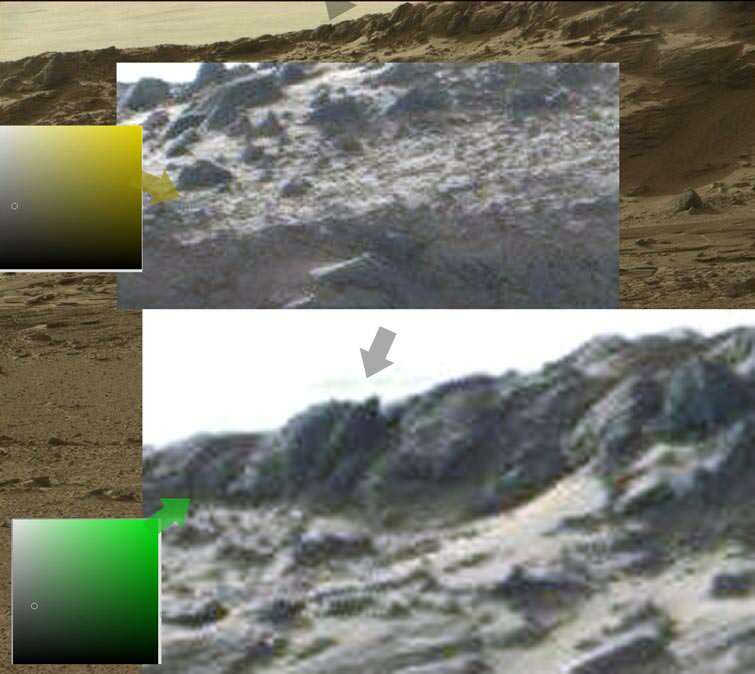 Lower image shows a plant like thing growing up the rock, (Photoshop shows that it is grey/green). 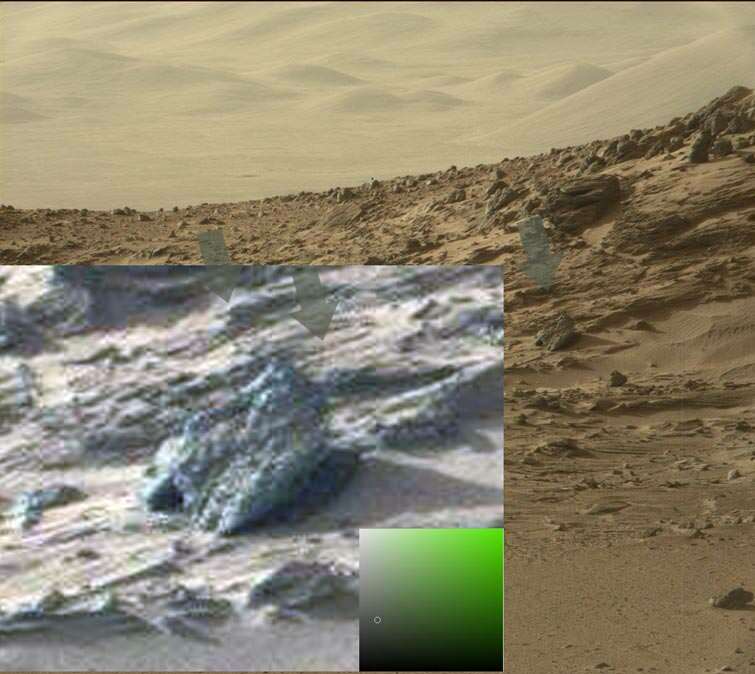 Upper image shows algae growing pretty much everywhere on this rock, but the Photoshop color picker shows yellow/green/grey. Although it also shows a more greenish grey on the edges. Or that Mars is in a drought, but it still could have experienced recent rain fall? The fact that it is deader on top, and greener on the edges of this rock, does clearly show that this is living and not oxidation of iron based rock. 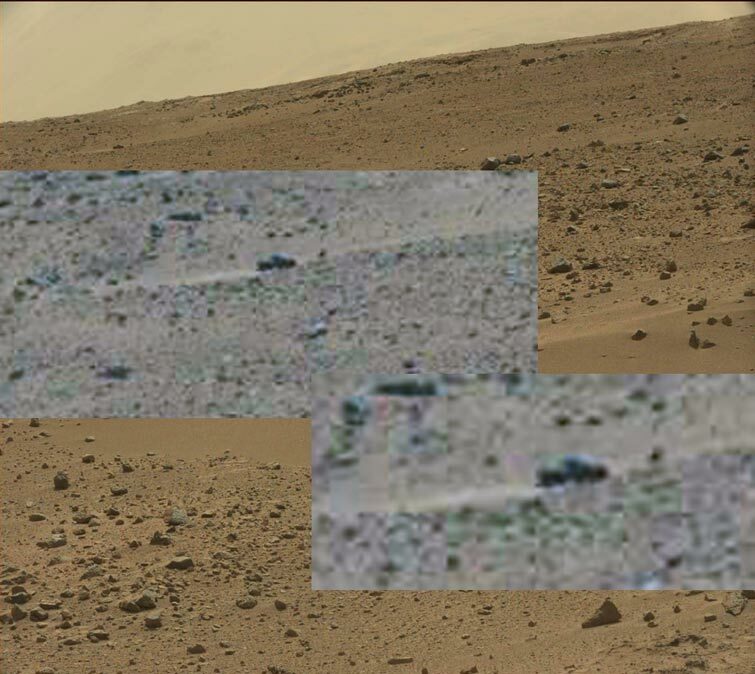 Which is the only other explanation, (Curiosity definitely has No green color). But l didn't find any Red Weed, lol. Did some fossicing for Earth algae today, and found this growing in death valley. Remarkably similar colors, and l cherry picked the greenest parts l could find, but yellow/green is the greenest bits l could find. And considering Mars actually has a stronger green than death valley has, probably makes Mars more likely to have alive algae than we do. I also took a look at Oxidized Earth rocks, but they are a distinctive yellow color, so we can cross that off for images like this, (l did a google search for algae images). Slam dunk that Mars has algae! And not a word from NASA. 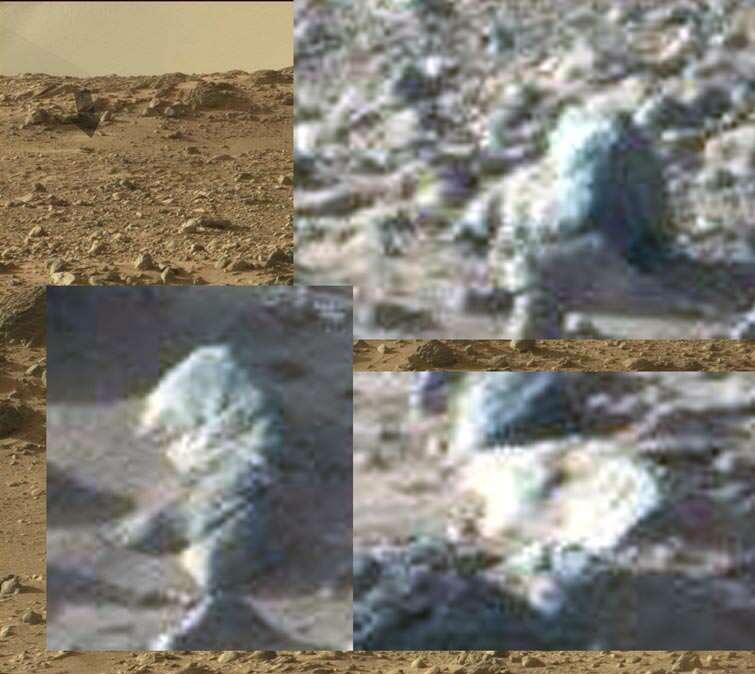 Ok, almost found a closeup of one of them, (probably the best we will get) and this martian algae does have tendrils growing out from the plant on the rock. And l did a color test on the greenest parts of this, showing that at least this one, is greener or more alive than the ones found in death valley on Earth! So Mars has plant life, NASA is obviously lying through their teeth, Vikings first results were accurate, and the area the Curiosity rover is in, is quite ironically a nicer environment than death valley. Well I certainly do not believe the "thing" in the above images looks like a crab, how preposterous! Maybe it's a real live pareidolia!!! 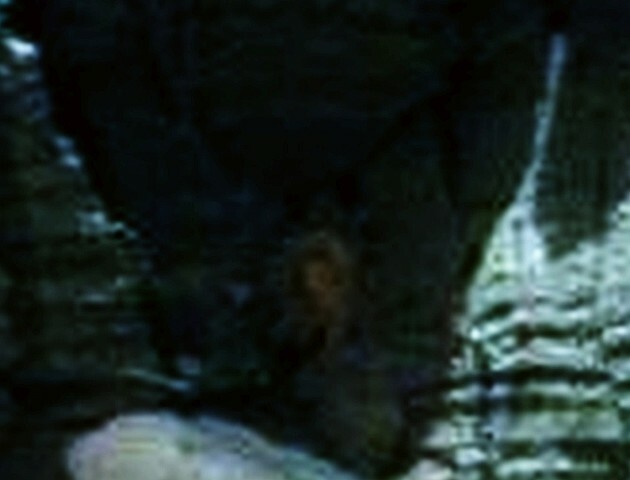 Could this really be a live being of some sort poking it head and torso out of an opening it the rock strata? And...where NASA has dolloped a "yellow haze" over the data point to blur it in with the surrounding "red hue" only to backfire when that red hue of the entire image is turned down leaving the tell tale yellow blur to tell the tale? Sure looks like it to me. Lichen appears to be moss, it is actually a fungus and an algae existing together in a symbiotic relationship. The algae manufactures food for the fungus during photosythesis. This relationship is what makes lichen. Not sure l got that off Google images, after typing in Algae. But you might be right, the mars one appears to have tendrils and is acting like fungus. The sun is setting on Mars. These ones clearly show a strong light source or the sun. And the cs2 color picker also shows that this white light comes from the yellow spectrum, which is our sun of course. Stark difference to the NASA blue only crap. 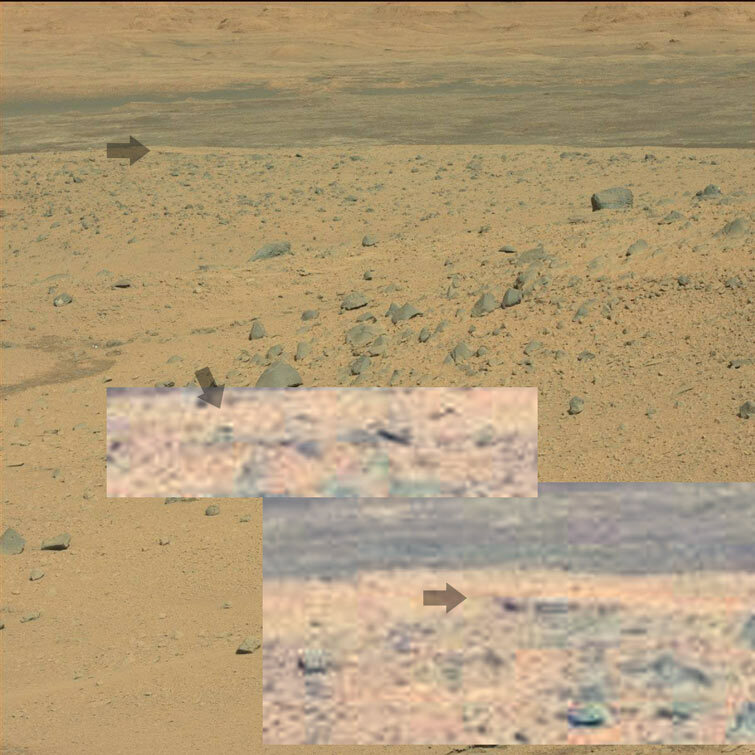 This also shows Curiosity being reflected back in a rock with a pink sky background, (well, the color picker shows that it is more purple). 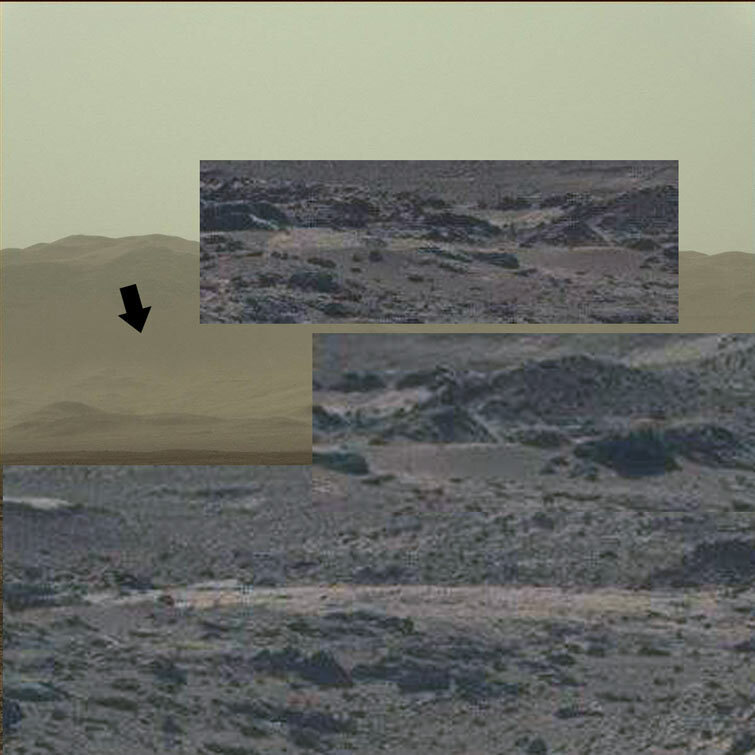 The top image shows part of the rovers wheel, and possibly a raincloud. And these Lichens, that are free standing, or almost look like roses, unopened. Color picker shows these to be yellow/green.